The TRUMPET program allowed me to get all the materials necessary to be a successful student. As a mother of three, working a full-time job, and going back to school, I was very thankful for the TRUMPET Program. Books can be very costly but he TRUMPET Program allowed me to use e-books without have to stress over having to purchase them. So very thankful for the TRUMPET Program. I have paid out of pocket for most of my semesters while attending NETC. It was such a weight lifted when I was able to borrow books without fees and returning them when the semester was completed . The books were in great condition and I am thankful I was given the opportunity to save money when it was needed. Thank you so much for your help! The TRUMPET Textbook Lending Program has greatly impacted my time at NETC. It has removed the stress of paying for high priced textbooks, and allowed me to spend my time working on classwork rather than worrying about paying for textbooks. If you are in need of textbooks for your classes, the TRUMPET program can help! 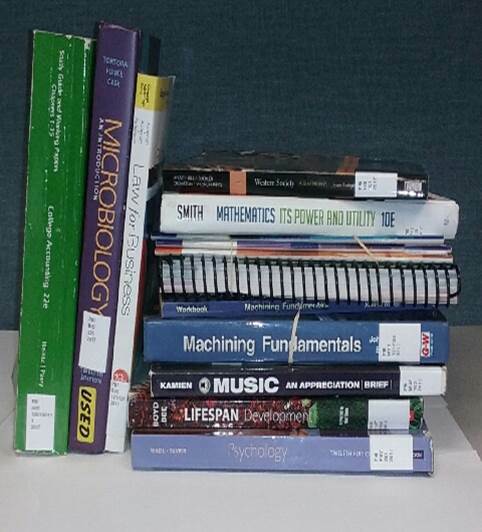 We have textbooks from various subjects available for check-out via our TRUMPET Textbook Lending Library. 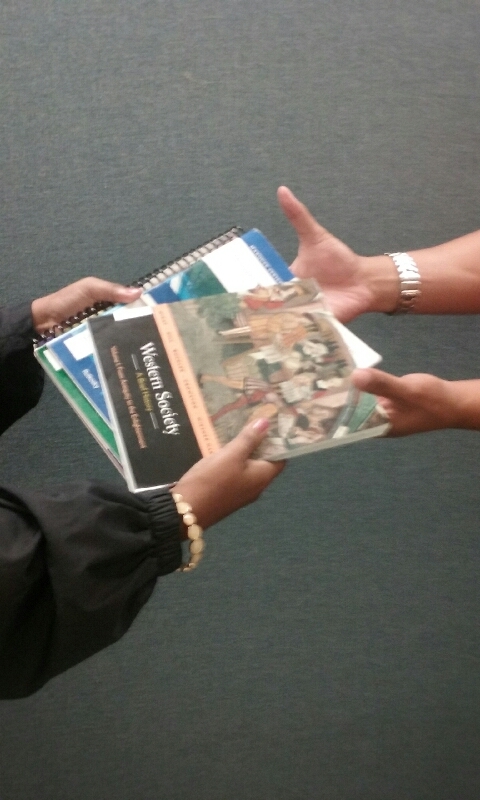 In order for our textbook lending program to remain successful, it is vital that all participants use and return textbook(s) on time. Must be currently enrolled at Northeastern Technical College. 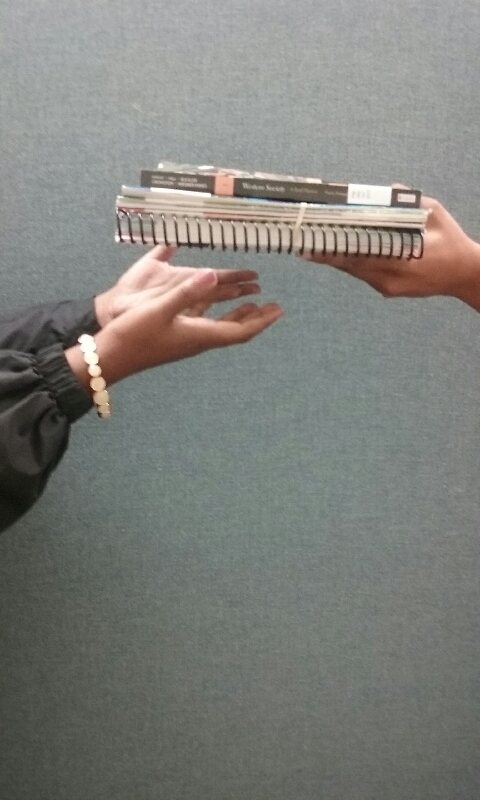 All books awarded in prior semesters must be returned. Must not have any outstanding debts to NETC. Must utilize a TRUMPET service in the concurrent semester (i.e. meet with a Cohort Support Staff member, face-to-face and/or online tutoring, or attend a TRUMPET sponsored workshop or event. No textbook request form, no textbook. 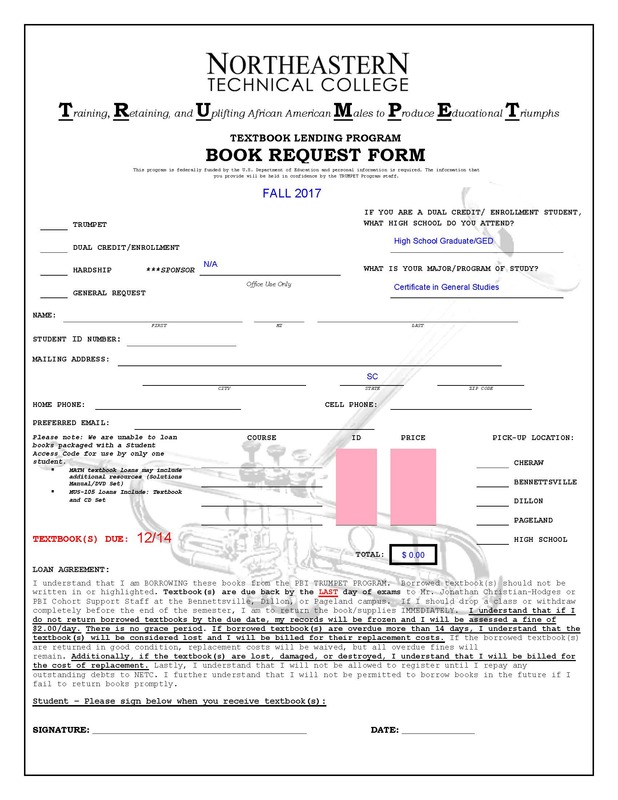 Students in need of a textbook should complete a TRUMPET Book Loan Request Form (See Below). Student does not have financial aid and lacks the money and/or resources to purchase textbook(s). Student has financial aid, but lacks enough aid to purchase textbook(s). CLICK IMAGE ON THE LEFT FOR THE LINK TO BOOK LOAN REQUEST FORM. Students will need to present their NETC ID and paid schedule at the time of pick-up. All textbooks received from the TRUMPET Textbook Lending Library are due by the last day of Final Exams to the PBI One-Stop Center on the Cheraw, Bennettsville, Dillon, or Pageland campuses.